NEW DELHI : “The situation of the country is the same today which prevailed at the time of Eid ulFitr. In fact it has deteriorated further. Lawlessness has become rampant. Whoever has power thinks that he is above the law. Incidents of mob lynching are taking place continuously. Organized groups come out and lynch anyone they find. Women are not safe even in their homes and families. Women are not safe anywhere in the world and especially so in our country. Efforts are being made to legalize homosexuality. The economy of the nation is in the hand of a few capitalists. Freedom of expression is being curtailed. The question is – should we remain silent in these circumstances and become mere mute spectators? Should we allow things to unfold and events to occur as they are? Undoubtedly our problems are graver. But we must make efforts to solve them. It is our responsibility not to remain aloof from them. 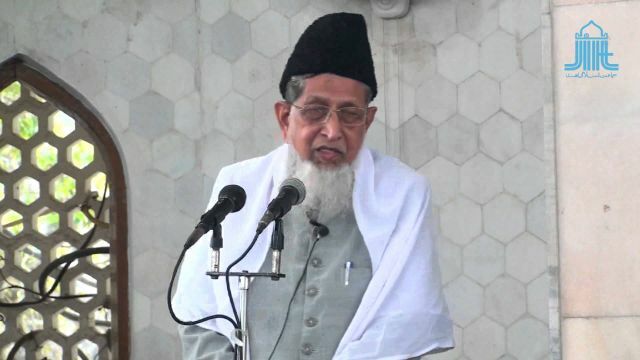 As sincere well-wishers of our nation it is our duty to struggle for the improvement in our current situation’’ said Maulana Syed Jalaluddin Umari – President of Jamaat-e-Islami Hind while addressing the Eid congregation at Jamiat headquarters in Jamia Nagar. The conditions in Arabia were much worse when the Prophet Muhammad ﷺwas given Prophethood. He was commanded to announce ‘’the Truth’’ and invite people to the straight path and call them towards Allah. The Prophet ﷺwas told to follow the path of Prophet Ibrahim (peace be upon him). The religion of Prophet Ibrahim was very simple, straightforward and directed and focused towards Allah. In the presentstate of affairs we have to perform two tasks. One is that we must follow the commands of Allah in all aspects and domains of our lives. We must lead our complete lives according to the Will of Allah. Our worship, our life and death should only be for Allah. When man submits his complete life to Allah, he then reaches the highest pedestal of worship and reaches the zenith of veneration towards hisCreator. The second task for Muslims is to invite people towards Allah. You should not become ‘’beggars’’ of this world craving for its material resources. Rather, you must become custodians of this world. If you do so then the problems that you face will also get solved and you will also be discharging your responsibility’’ continued Maulana Umri. The Jamaat chief also delved on some of the issues pertaining to Eid-al-Adha. He averred that: ‘’ the most cherished deed on the day of Eid-al-Adha is that of sacrifice (qurbani). It is obligatory on every Muslim who is financially capable (Sahib eNisaab). It is the ‘’sunnat’’ (way) of Prophet Ibrahim (peace be upon him) and which is followed by Muslims throughout the world. Maulana Umari also appealed for people to donate generously for the Kerala Flood Relief. He mentioned that such a calamity has not befallen Kerala in a hundred years. The people of Kerala have always led from the front whenever any natural calamity has occurred anywhere in the country. Now it is our duty to extend a helping hand to them in their hour of crisis.